Image of the Day: Saturn’s Titan -Will We Find Life There? Saturn’s giant moon Titan has water frozen as hard as granite and Great Lakes-sized bodies of fed by a complete liquid cycle, much like the hydrological cycle on Earth, but made up of methane and ethane rather than on water. Methane and ethane, the simplest hydrocarbon molecules, can assemble themselves into fantastically complex structures. Since complex hydrocarbons form the basis of life on Earth, scientists are wondering if hydrocarbon chemistry on Titan could have crossed the chasm from inanimate matter to some form of life? It seems perfectly appropriate that one of the prime candidates for life in our solar system, Saturn's largest moon, should have surface lakes, lightning, shorelines, relatively thick nitrogen atmosphere -and seasons. Titan can be viewed as an early-model Earth. And 100% of all known Earths have awesome life on them. The significantly lower temperature is a bit of a stumbling block (it's ten times as far from the sun as us), but there's a strong possibility of subterranean microbial life – or even a prebiotic "Life could happen!" environment. 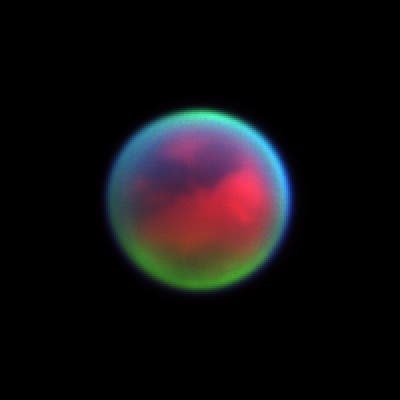 If a space traveler ever visits Titan, they will find a world where temperatures plunge to minus 274 degrees Fahrenheit, methane rains from the sky and dunes of ice or tar cover the planet's most arid regions -a cold mirror image of Earth's tropical climate, according to scientists at the University of Chicago. Titan's ice is stronger than most bedrock found on earth, yet it is more brittle, causing it to erode more easily, according to new research by San Francisco State University Assistant Professor Leonard Sklar. Sklar and his team developed new measurements from tests on ice as cold as minus 170 degrees Celcius which demonstrate that ice gets stronger as temperature decreases. Understanding ice and its resistance to erosion is critical to answering how Titan's earth-like landscape formed. Titan has lakes, rivers and dunes, but its bedrock is made of ice as cold as minus 180 degrees Celcius, eroded by rivers of liquid methane. Titan, one of Saturn's 60 moons, is the only moon in the solar system large enough to support an atmosphere. Pierrehumbert and colleague Jonathan Mitchell, have been comparing observations of Titan collected by the Cassini space probe and the Hubble Space Telescope with their own computer simulations of the moon's atmosphere. Physicists from the University of Granada and University of Valencia, analyzing data sent by the Cassini-Huygens probe from Titan, have “unequivocally” proved that there is natural electrical activity on Titan. The world scientist community believes that the probability of organic molecules, precursors of life, being formed is higher on planets or moons which have an atmosphere with electrical storms. Scientists with NASA's Cassini mission have monitored Titan's atmosphere for three-and-a-half years, between July 2004 and December 2007, and observed more than 200 clouds. They found that the way these clouds are distributed around Titan matches scientists' global circulation models. The only exception is timing — clouds are still noticeable in the southern hemisphere while fall is approaching. Scientists will continue to observe the long-term changes during Cassini's extended mission, which runs until the fall of 2010, which will offer plenty of opportunities to monitor climate change on Titan — the spacecraft makes its next flyby of the moon on June 6. We'll learn if the sluggish weather is the result of a slow rate of temperature change at the surface. "Additional flybys may tell us whether the crust is thick or thin todaf," says Jonathan Lunine, a Cassini interdisciplinary investigator with the University of Rome, Tor Vergata, Italy, and the University of Arizona, Tucson. "With that information we may have a better understanding of how methane, the ephemeral working fluid of Titan's rivers, lakes and clouds, has been resupplied over geologic time. Like the history of water on Earth, this is fundamental to a deep picture of the nature of Titan through time." Image Top: Titan's vast dune fields may act like weather vanes to determine general wind direction, have been mapped by scientists who compiled four years of radar data collected by the Cassini spacecraft. New infrared images showing the global cloud pattern are available at: http://saturn.jpl.nasa.gov and http://www.nasa.gov/cassini .